This page is a listing of various bicycle crank sets, and the bottom brackets that fit them. "Spec" indicates that you got the information from a manufacturer's data sheet or other publication. 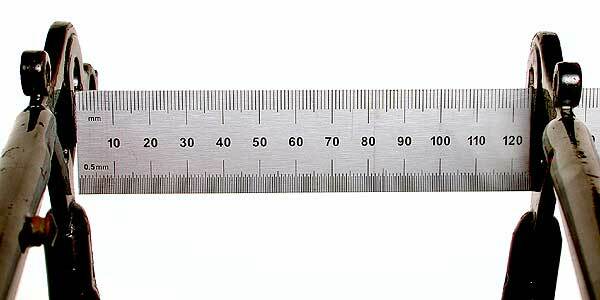 "Measurement" indicates that you have measured a crank installed on a bicycle. Please measure everything in millimieters. Most cotterless cranks use tapered square axles. Some newer models are splined. For splined cranks, it would be helpful to specify the spline pattern if known. Items above in red are essential. If you can't supply all 5 of these bits of info, don't bother submitting. This would be the distance from the inner surface of the innermost chainring to the centerline of the seat tube or down tube. This would be the distance from the inside of the right crank to the centerline of the seat tube or down tube, measured at the centerline of where the pedal screws in. This would be the distance from the inside of the left crank to the centerline of the seat tube or down tube, measured at the centerline of where the pedal screws in. This is the horizontal width of the crankset from pedal mount to pedal mount. It is equal to the sum of the crank clearances above, plus the thickness of each crank. I can do the math if you provide the measurements. This is a useful item if you know it. Most of the size information on this list was provided by people like you. I have no way to check the accuracy of the data. It should be noted that frames can be reamed out to take a larger sized seatpost, and sometimes a replacement seatpost may be a slightly different size than the original. Substituting the "symmetrical equivalent" bottom bracket will preserve the position of the right crank and chainwheel, but the left side will often wind up farther out. These spindles are getting harder and harder to find. In many cases, it makes more sense to upgrade to an inexpensive modern cartridge bottom bracket. "3" series spindles normally fit 68 mm ISO/British/French bottom brackets. "5" series spindles normally fit 70 mm Italian bottom brackets, also 68 mm French with thin cups. "7" series spindles fit "oversized" 73 mm ISO/British bottom brackets, sometimes also work with Raleigh 26 TPI cups in older Nottingham-built Raleigh bikes . Chainring clearance more with steel inner ring, less with aluminum. BMX Single/Double 107 Square 43.4* 38.4 158 110 *43.4 chainline as double. 39.9 inner position, 46.9 outer position. Sorry, no other data yet on this brand. Sorry, no data yet on this brand. Ofmega cranks, including those branded "Avocet" use a non-standard spindle, thinner than either J.I.S. or ISO spindles. As far as I know, nothing else works. 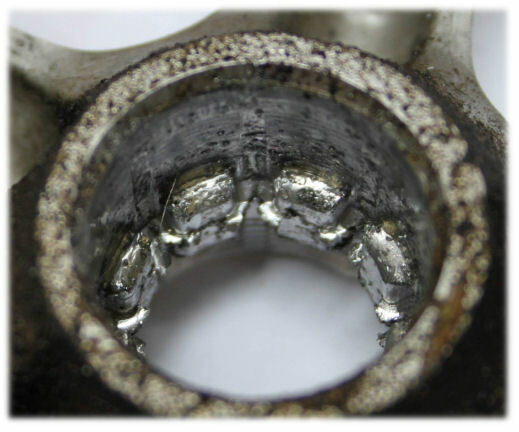 Shimano cartridge bottom brackets are typically coded with a model designation and two numbers: shell width and length. Square Taper: CT21, LP27, UN40, UN51, UN52, UN71, UN72, UN91. These are all interchangeable if the other numbers match. Listed in order of quality, CT21 is worst, UN91 is best. V1 BB spline grooves 5 mm long, ridges 2.2 mm wide. V2 BB spline grooves 9 mm long, ridges 2.8 mm wide. Note: Octalink ® V1 and V2 splined bottom brackets are very similar looking but if you use the wrong version you will ruin your crank! If in doubt, measure. plow into the grooves in an Octalink V1 crank. Thanks to David Richardson for the photo. Hollowtech II ® Two-Piece Cranksets: Shimano's latest top-of-the line system is a two-piece crankset. One piece is the combined right crank and spindle, the other piece is the left crank. Hollowtech II uses separate bearing modules that screw onto the opposite sides of the frame. Since the spindle is part of the right crank, there's no issue of compatibility. All Hollowtech II cranks work with all Hollowtech II bearing units. Any crank that fits on one type of spindle will fit on all spindles of that type, but if the length is incorrect, the chainline/clearance will vary. 73 for oversized ISO/British. This dimension has to do with what kind of frame the bottom bracket fits, and has nothing to do with the crank. Length: overall spindle length in millimeters. This will determine the chainline and various clearance dimensions. Shimano sometimes specs two different lengths for the same crankset. This usually relates to the diameter of the seat tube. The shorter dimension is normally preferred, but bikes with fat seat tubes may require the longer size to accommodate the swing of the front derailer. See Shimano dealer for free replacement. 107 for 68 mm BB; 109 for 70 mm (Italian). Uses special cups, will not fit through hole in others. See also: TA for older models. 127.5 + 2 mm spacer Square 150 110/74 Shimano UN-72 BB. 115.5 + 2 mm spacer Square 42.5 139 110/74 Shimano UN-73 BB. XD 300 5-bolt Triple 113-118 Square 110/74 As short as 107 works with some road bikes. XD 500 5-bolt Triple 113-118 Square 110/74 2001 As short as 107 works with some road bikes. XD 600 5-bolt Triple 113-118 Square 110/74 As short as 107 works with some road bikes. As Shimano, which is outlined on your web page, in which chainline is measured from the frame centerline to the INSIDE surface of the chainring teeth on the middle chainring. As most other manufacturers use, and is defined in the ISIS Drive standard, in which chainline is measured from the frame centerline to the CENTER of the tooth of the middle chainring. For typical 2mm thick chainring teeth, these two measurement methods differ by 1mm, even though the chainring ends up in the same physical location relative to the frame centerline. Hence, a Shimano 47.5 mm chainline is equivalent to an ISIS Drive 48.5 mm chainline. Further, the confusion that your table is attempting to help solve is the same confusion that we tried to address in the ISIS Drive standard. In the case of ISIS Drive, the standard spindle lengths are symmetric and vary in multiples of 5 mm. Thus, if you know the chainline is 48.5 mm with a 113 mm ISIS Drive spindle length, then you automatically know that if you use a 118 mm ISIS Drive spindle length your chainline will increase by 2.5 mm (each crank moves outward 2.5 mm, for a total of 5 mm). A note regarding these differences in chainline measurement on your web page may help some people better understand why a manufacturer claims a 48.5 mm chainline but when they measure it (per Shimano) it is 47.5 mm. 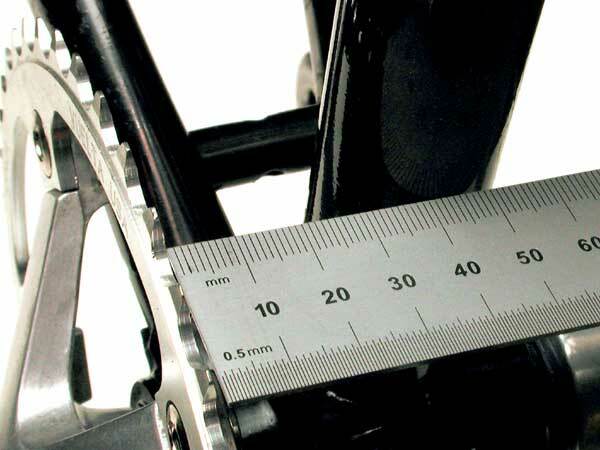 You can measure the front chainline directly with a simple ruler. Simply hold the ruler against the seat tube or down tube and measure the distance to the middle of the chainring teeth. In the case of triple chainwheel sets, measure to the middle chainring. In the case of doubles, measure to the halfway point between the two rings. To measure rear chainline, the easiest way is to measure the distance from the inside of the rear fork end (or the outside of the axle locknut) to the middle of the sprocket. Double this, subtract it from the over-lock-nut dimension of the hub (or the frame spacing , which should be the same), then divide the result in half, and you have the rear chainline. Wider chainline need for chainstay clearance on MTBs. Traditional cotterless cranksets use a tapered square axle end. The sides of the end taper at a 2 degree angle compared to the centerline, 4 degrees compared to each other. While there is general agreement about the angle, there is no such agreement about the actual width cut off. result that J.I.S. cranks will move about 4.5 mm further in. onto the spindle. The result again is a higher risk of breaking the crank. J.I.S. (2 * sin 2 * 4.5 = 0.3)? ISO cranks (Campagnolo, Stronglight, others) won't go as far onto J.I.S. spindles as they ideally should. J.I.S. cranks (most Japanese models) may bottom out if installed on ISO spindles. In practice, you can very often get away with mixing these sizes, as long as you select an axle length that gives the desired chainline. In the case of ISIS Drive, the standard spindle lengths are symmetric and vary in multiples of 5 mm. Thus, if you know the chainline is 48.5 mm with a 113 mm ISIS Drive spindle length, then you automatically know that if you use a 118 mm ISIS Drive spindle length your chainline will increase by 2.5 mm (each crank moves outward 2.5 mm, for a total of 5 mm). Shimano spec, measured to the middle ring. Note that this results in the middle chainwheel's being to the right of the chainline for the middle rear sprocket.